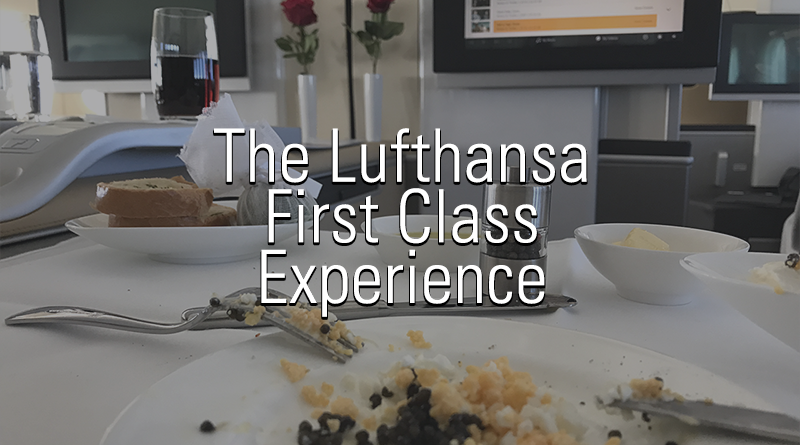 The Lufthansa First Class experience is something unique: probably the best First Class product offered by any European airline and among the top 5 worldwide. After saving Lufthansa Miles & More award miles for over 7 years, I finally decided to spend them all and fly to New York for an enjoyable holiday with my wife and some friends. 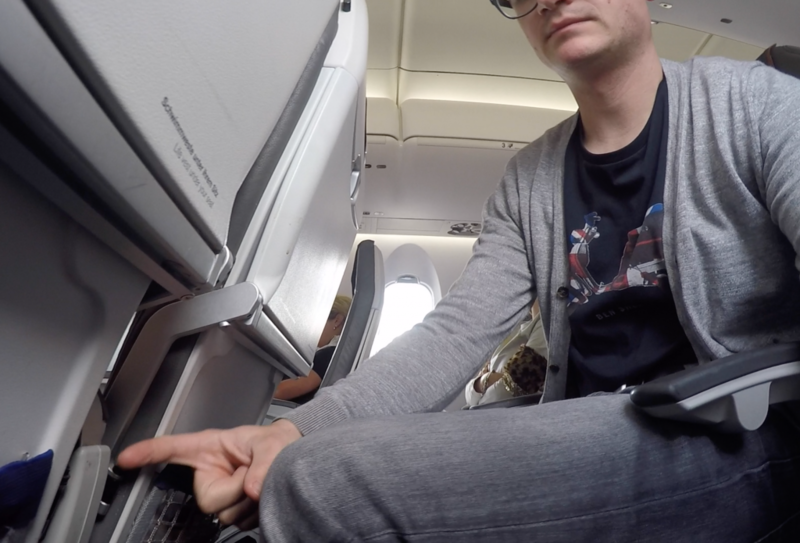 What’s so special about First Class and why is the Lufthansa First Class Experience so good? First of all, you should have a look at my trip report. It shows how enjoyable the service is. Limo transfer: because the First Class Terminal is disconnected from the rest of the airport, you’re driven to the plane in a luxury vehicle. Attention to detail: the staff is well-trained and has an eye for detail. They pay attention to what you like and dislike and adjust the service accordingly. After a while they stopped asking for my drink preferences and just brought the stuff they knew I liked. 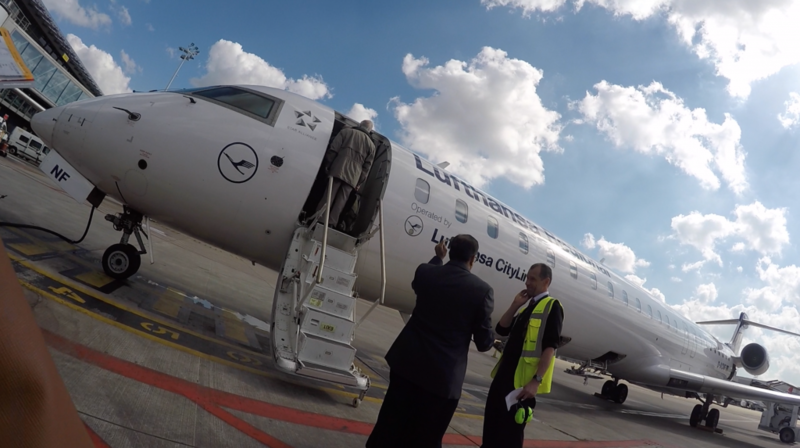 Our trip started in Brussels where we would take a intra-European business class flight to Frankfurt. We were allowed access to The Loft, the business class lounge by Brussels Airlines. Great looking lounge, limited food options though. But given those limitations, the flight was fine: it only took us an hour to fly to Frankfurt and we got food and drinks. Usually when flying to Frankfurt from Brussels, the plane will not be attached to a jet bridge, but will be at a remote stand. Usually that’s bad news. But in our case that was great news! If you’re a First Class passenger arriving at Frankfurt at a remote stand, you’ll get a limo transfer to the main terminal. Exactly what I was hoping, exactly what we got. I was hoping for a Porsche Cayenne, but since there were 3 First Class passengers transferring, we got a luxury Mercedes Vito. Not bad either. The limo drives you across the tarmac, giving you some great views. They drop you off at the main terminal. Awesome service! From the A-section of terminal 1 in Frankfurt, it’s a 5-minute walk to the First Class Terminal. The minute we set foot into the FCT, our personal assistant greeted us, took our passports for processing and helped us through security. The FCT has a dedicated security line. Safe to say that there’s no queue. 2 minutes later we were in the lounge. The lounge itself is smaller than I expected. It has plenty of seating, there’s a huge bar, there’s an à-la-carte restaurant that also has a nice buffet. There’s a cigar lounge, there are showers and sleeping rooms. We spent a couple of hours in this super-exclusive lounge. We ate, we drank, we relaxed and minutes before boarding was announced, our personal assistant took us to the elevator, gave us our passports and introduced us to our limo driver. Unfortunately there were 3 First Class passengers on the flight, departing from the FCT. So no Porsche, but a Mercedes again. We exited the vehicle, walked on the tarmac and entered the dedicated jet bridge via an elevator. Minutes later, we were in our seats, enjoying some pre-departure drinks. Once we settled in, the cabin crew introduced themselves. Uli was our main man, he took care of us and couldn’t have been more attentive. He prepared some nice champagne for my wife and brought me a bitter lemon, as you can see in the picture below. Off to #jfk on @lufthansa #firstclass. The next couple of hours were all about wining and dining. Exclude the wining part for me, since I don’t drink alcohol. I did however, fully enjoy the caviar service. I never had it before, I didn’t know how to prepare or eat it, but luckily Uli helped me out. Honestly, it was delicious! An intricate and sophisticated taste, but also quite salty. The condiments where refreshing too. The crew tried to feed us excessive amounts of food, but I already had so much in the lounge. After a while I had to refuse. Lufthansa First Class bedding is very comfortable: the seat converts into a bed, or a lounge chair, or anything in between. In our case, we didn’t go full lie-flat since it was a daytime flight. Uli made sure we had a mattress pad, a duvet and a pillow. An excellent setting to watch some movies. If you would book this flight one-way using actual money, you’d pay about 6700 EUR. I agree, that’s pretty steep! Luckily, I didn’t pay for it. Instead I used 85000 Miles & More miles per person. That’s 170000 in total. This includes a stopover in Frankfurt, but excludes taxes and surcharges. These surcharges aren’t cheap on Lufthansa and can cost you a couple of hundred Euros. That’s completely worth it given the price of a First Class ticket. Go to the Mileage calculator to calculate the amount of miles you need to get to your destination in style. If you’re not a Miles & More member, but a member of another Star Alliance frequent flyer program, chances are that you can book it through that program. Unfortunately Lufthansa only releases award space 2 weeks in advance for partner airlines. 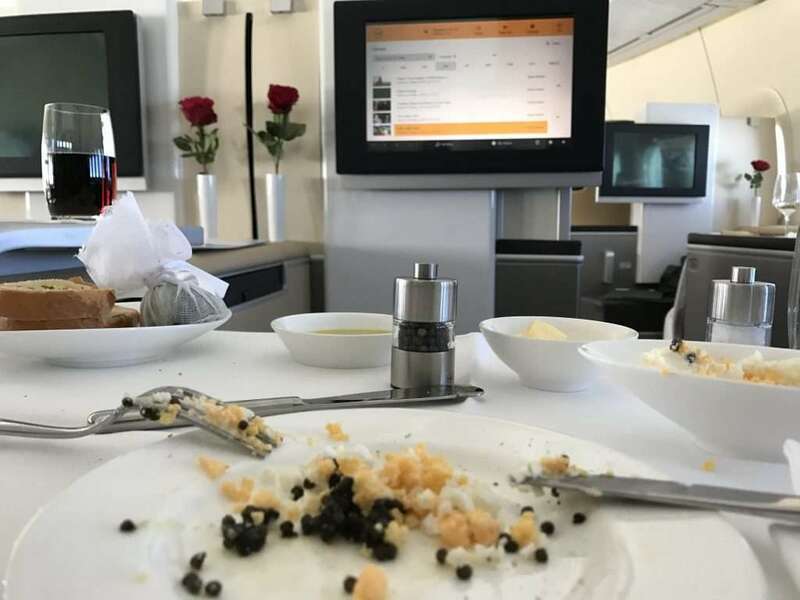 The Lufthansa First Class Experience is amazing. It is very expensive, but luckily some award seats become available for each flight. This means you can book it via frequent flyer miles. Save your miles and eventually spend them on aspirational trips such as this one. It has been on my list for a very long time, now I can finally tick that box. Time to save up again and spend the next couple of years collecting enough air miles to do all over again.